Today’s archers have seen it all. They’ve put their savvy hands upon hyper-speedy bows, indestructible arrows, and blood curling broadheads that shred meat like a grinder. The consumers of 2010 are truly experts of their own. They make up a distinct population that relies heavily on credible testimonials, hands-on interactivity, and most importantly, results. If I were asked to testify who I am as a sportsman in our great hunting community, I’d simply respond to the following question from most important to least. First, I am a diehard hunter. Second, I am an average consumer just like every person that walks into a sporting goods pro shop. Third, I am an outdoor TV personality. My purchasing and backing efforts go far past the media driven mania of our “plugged-in” culture. I am, and always will be a hunter that seeks success due to proven results. My background and college degree is hardwired in the marketing and advertising field. Thankfully, I’ve been able to sift through the new gimmicks, ploys, and mounds of junk introduced to our industry long before ever breaking out my credit card. Below you will find my first list of products that have made me a believer. Products that were put to the test by various industry experts and used by savvy consumers just like you. Finally… a new product that works! Trade shows are a stepping-stone for new businesses to make it or break it in the whirlwind-world of wacky whitetail. There’s more gimmicky items offered at a trade show than a week’s worth of late night infomercials! It’s a very rare occasion that I actually spot a crowd of sparkling eyes and drooling mouths with their feet glued gawking at a brand new booth showcasing the next greatest items offered to the hunting public. Bill Copus, owner and inventor of Oak Sturdy, LLC has introduced a few products to the industry that are no-brainers! 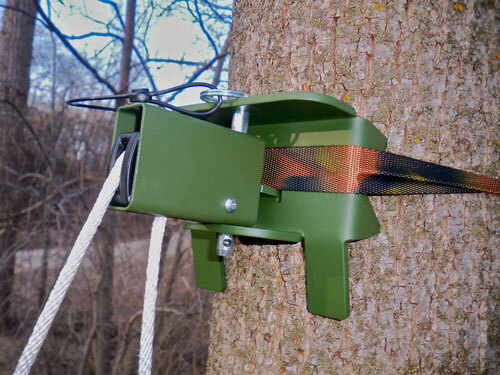 His tree stand pulley-system is used to eliminate the struggle of wrestling a bulky stand up a tree and potentially causing a fatal accident. His ingenious invention is a super quick, ridiculously easy, and virtually silent way to hang a stand in minutes! Simply climb your stand’s sticks, steps, or ladder. 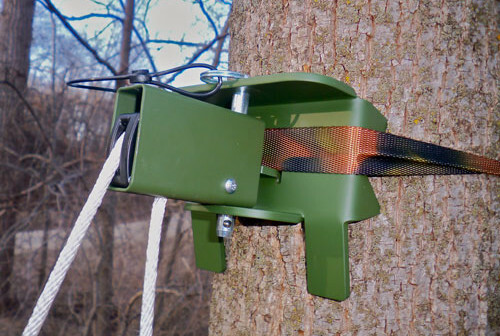 Ratchet the pulley-system around the tree to your desired stand height. Climb down. Tie your stand to the rope. Pull it up with 2-fingers! Done! Copus is currently working on more innovative products that will revolutionize the simplicity of hunting gear that work! Be sure to check out his entire line of easy-to-use products at www.oaksturdy.com. The Breath Taker is revolutionary scent prevention product that will enhance our success in the field. 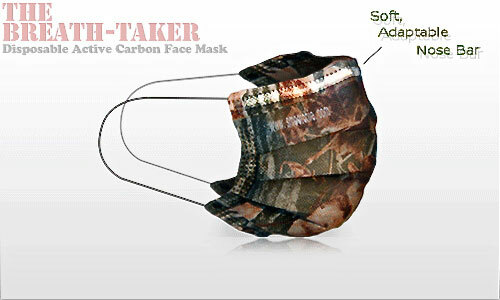 This disposable active carbon facemask is the missing link in total scent elimination. Put down the gimmicky gum, meaningless mouth rinse, or phony tablet scent eliminators. Pick up something that has been statistically proven to work in the field and lab. Depending on the person, between 30% – 80% of human scent comes directly from the simple act of breathing. At the rate of 60-gallon an hour, these large volumes of airborne human specific scents deter our success factors in the whitetail woods. The Breath Taker is an easy to use comfortable camouflage mask that contains 60 GSM SGS certified carbon layer as well as highly breathable filtration layer that screens out dust, pollens, and allergens down to 5 microns. This is a mask that will have whitetails around the country wondering twice about their ‘keen’ sense of smell! To learn more about the Breath Taker visit their website at www.TheBreath-Taker.com. It has taken years for a company to introduce a product that aids archers in building their “Bow-Shape” strength, accuracy, and precision! That is, until now! 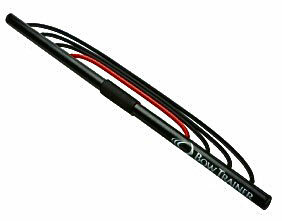 The Bow Trainer offers form-specific resistance training for archers of any age and ability. The exercise motion replicates the drawing of a bow; both compound and recurve, and utilize the exact muscle set that is used to draw a bow. You are able to draw a wide range of forces, from 3 pounds to 130 pounds. 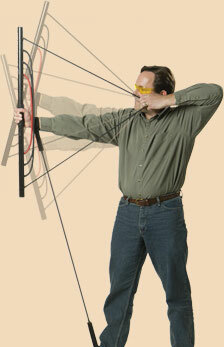 The Bow Trainer allows archers from all ages to remain in “Bow Shape” year round. Whether it’s on the couch in front of the TV or straight out of your bow case before you shoot, the Bow Trainer is a universal training system that warms up your muscles and helps prevent archery strain related injuries. Each Bow Trainer comes with a Resistance Chart that specifically customizes your exercise routine, and allows the user to measure his/her improvement toward accomplishing their goal. This indoor/outdoor tool will make you a better archery simply by sitting, standing, or kneeling! You may find more information about the Bow Trainer at www.Bow-Trainer.com.